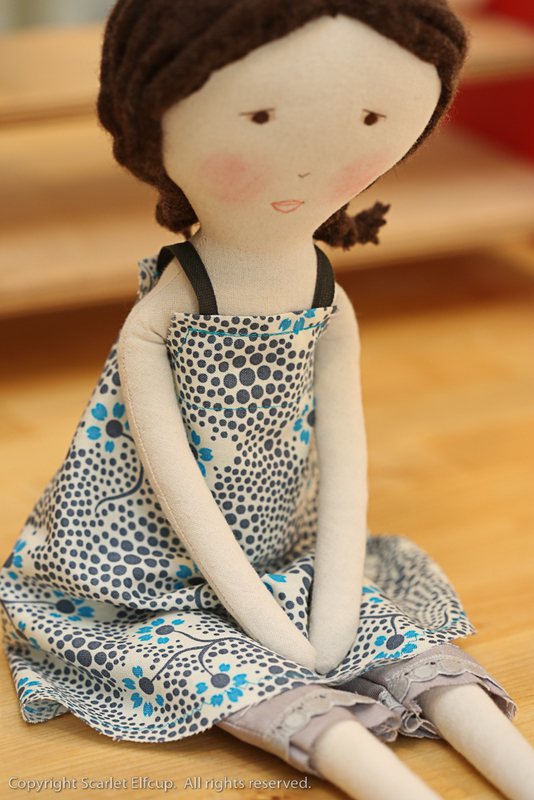 In December 2015 I started on a project to make a couple dolls for a good friend's daughter's 7th birthday and one for my own daughter's birthday. 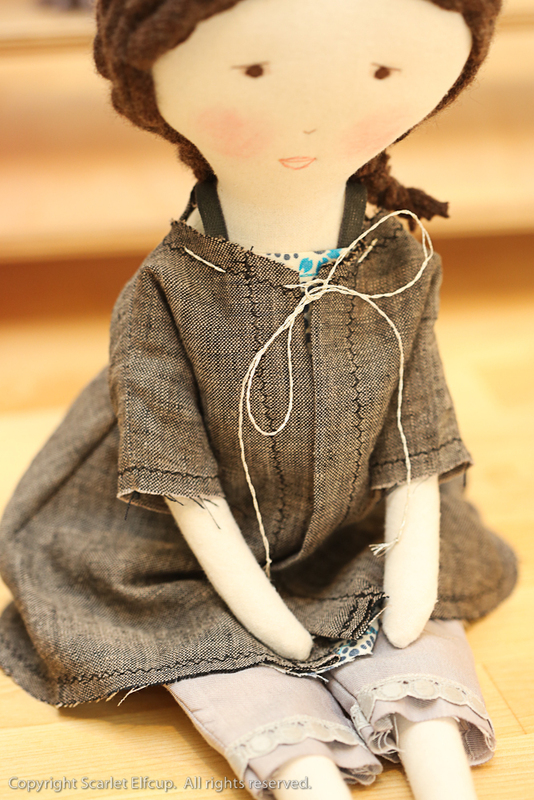 I wanted to make something different than what I normally create, which are the Waldorf-style dolls. 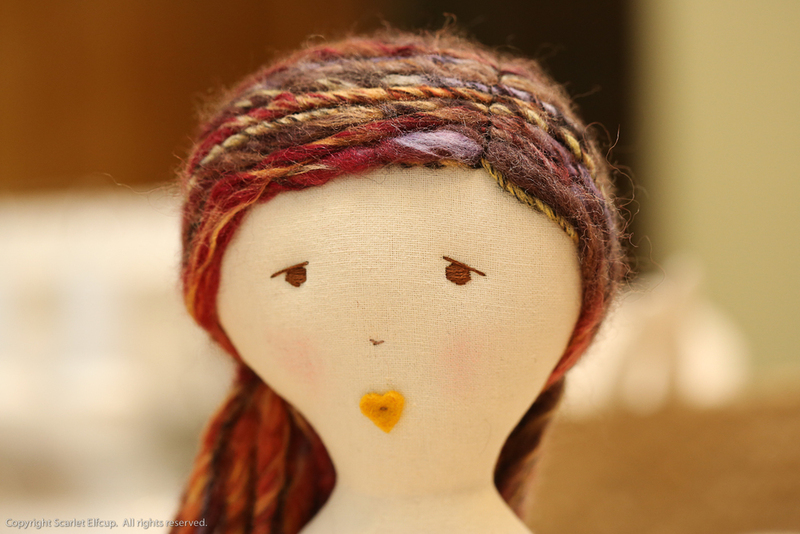 In early 2015, I picked up a book by a local doll artist, Jess Brown. Jess Brown is from Petaluma, CA and her dolls are renowned worldwide and can be found in specialty shops across the Bay Area and the US. I always admired these dolls when I saw them in shops...their sophisticated look, their unique star eyes, their simple construction, their heart shaped lips...all signatures of a Jess Brown doll. 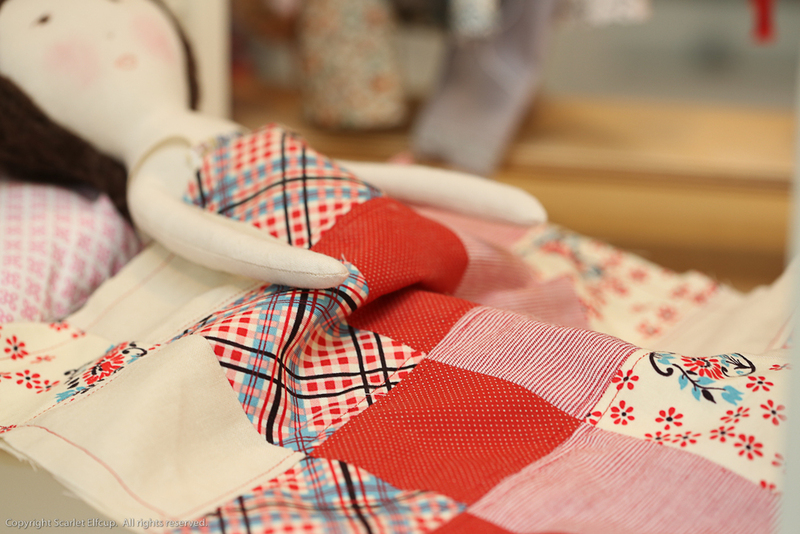 When Jess Brown released her published book in August 2014, I couldn't wait to get my hands on one and give a go at making a Jess Brown rag doll. It wasn't until the end of 2015 that I found some time to begin this project and it's in thanks to two little girls' birthdays. 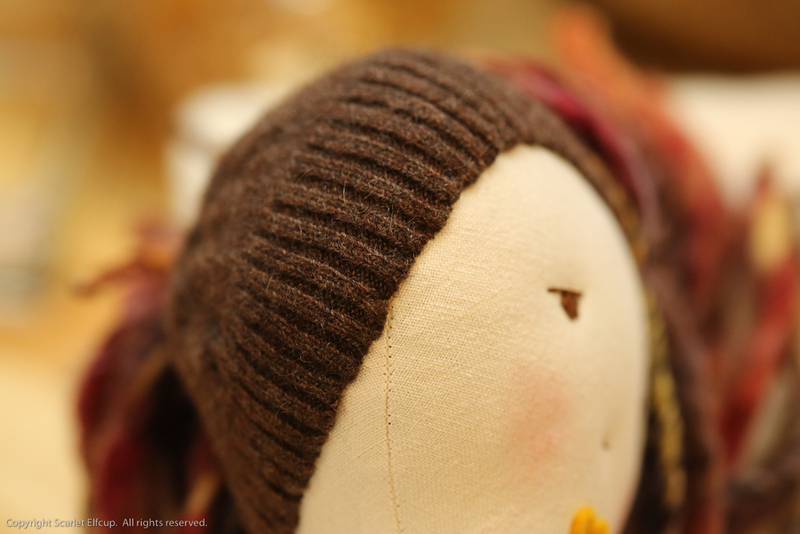 So, here's to sharing my experience in making the Jess Brown rag doll. 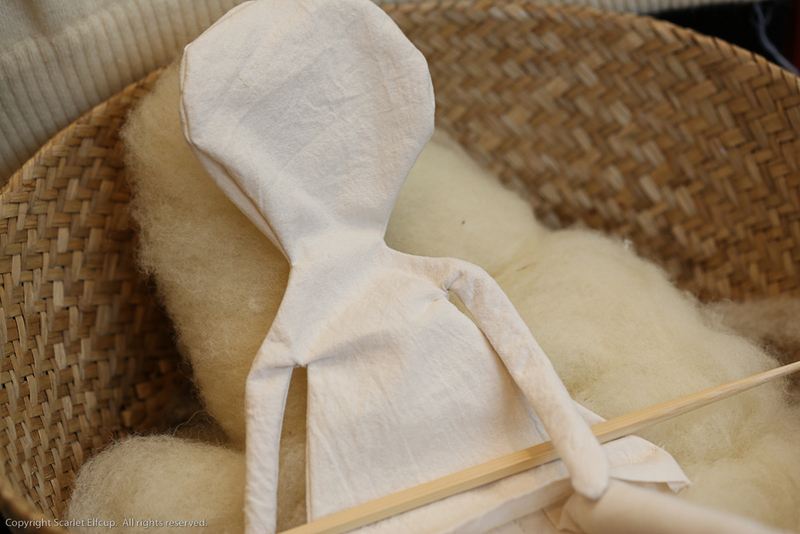 The construction of the Jess Brown rag doll is a simple one made from muslin cotton, which can be bought at a very affordable price from any local craft or fabric shop. For the ones I made, I chose to use a cotton fabric from India that I tea-dyed to give a bit of color to the skin. Jess Brown prefers corn fiber stuffing, which I've not yet had the experience of working with, but hope to one day. 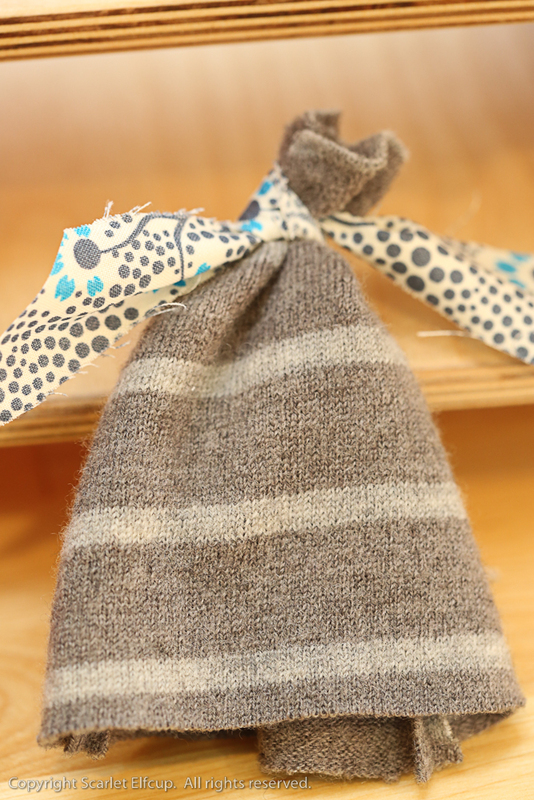 Instead of the corn fiber stuffing, I used what I have on hand...100% clean carded wool. 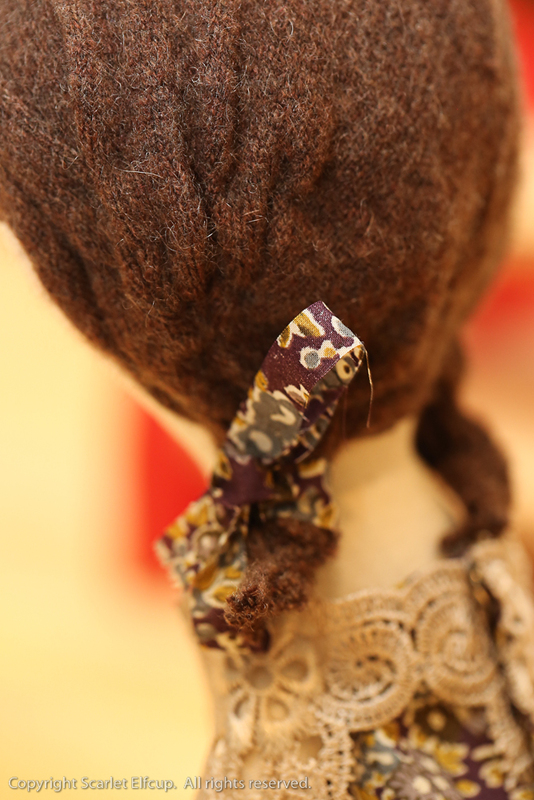 One of the best and most beautiful features of Jess Brown's dolls is the construction of the hair. 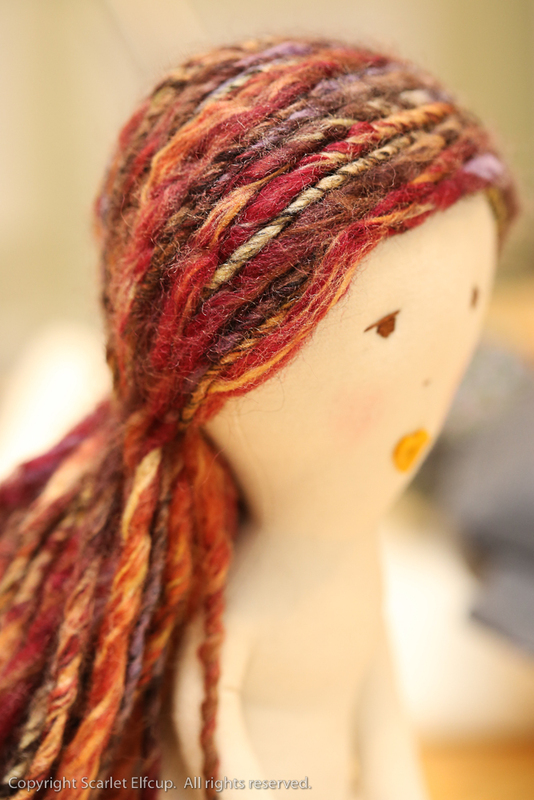 Jess Brown dolls have hair that is typically made from cashmere and sewn directly onto the head. It can come in neutral tones or wildly colorful and beautiful bright tones. It can be styled in many different ways depending on how it's sewn. The fun and imagination is really up to the individual and is truly endless. For the ones I made, I chose to stay with neutral tones. For one I made the hair from a wool-blended yarn and made it long for more styling fun. For the other I went with the classic Jess Brown look and used 100% cashmere. Both were extremely fun to work with and especially exciting to see the final look on the doll. You know a Jess Brown doll face when you see one...the unique star eyes, the lack of a nose, the felt heart-shaped lips. Instead of this signature look, I took to my own looks. For the eyes, I made round embroidered eyes. For one I added a tiny fleck of color simply for the sake of trying something different. 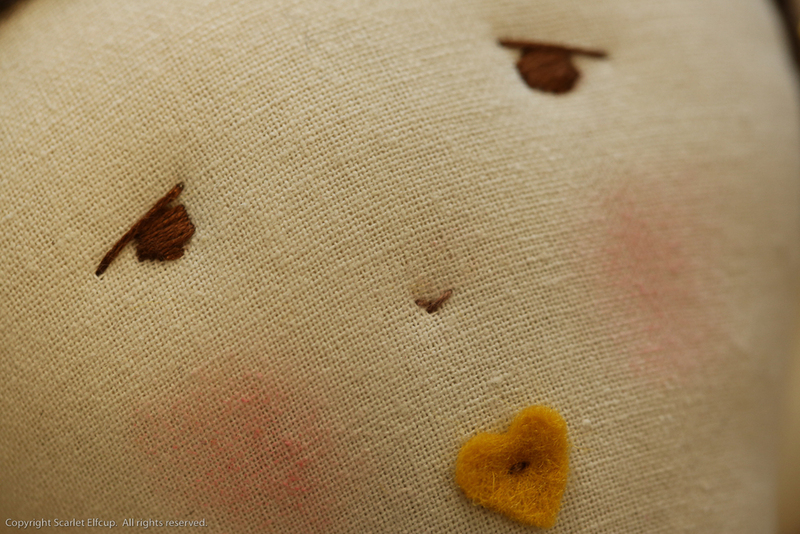 For the nose...a dash of embroidery thread. On one I tried the Jess Brown look with the felt heart shape and on the other I embroidered the lips. Both turned out fun and beautiful. 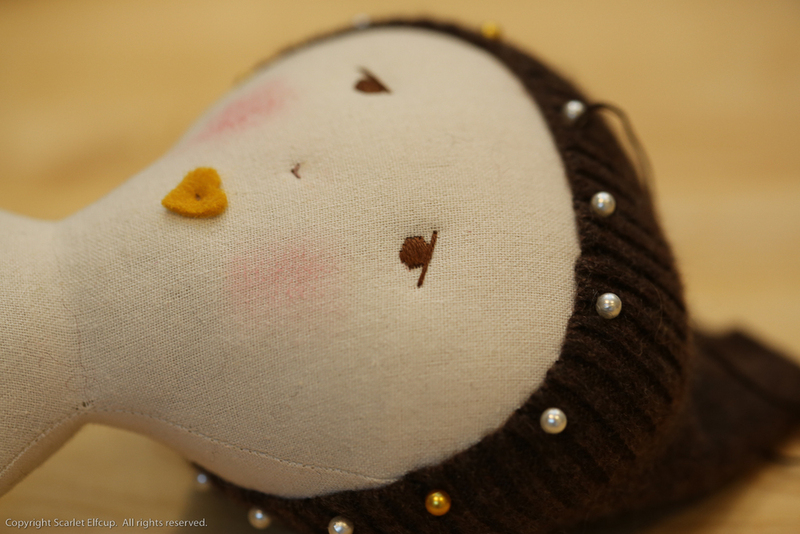 For the cheeks, rosy red beeswax was added for color. Knickers...make as many as you like in as many colors and patterns as you like. Use as much or as little trim as you want. Sundress...oh!, the infinite array of ways that you can make this dress and oh the fun you'll have. Jess Brown's sundress lends itself to so many styles and designs you can form from one pattern. Use beautiful delicate trim to your heart's delight and make it as creative as you want by using it for shoulder straps, sleeves, on the dress, at the bottom of the dress, behind the dress. You could probably make the entire dress from trim if you so desired. Such a versatile, simple and fun design. On the sundress, one thing I did change and make different from Jess Brown's design was to make the back fully open and close with two snap buttons. 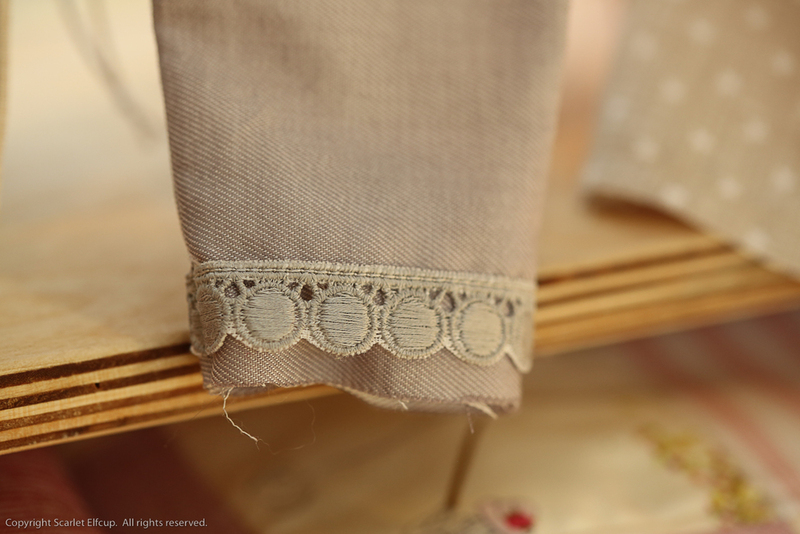 The pattern provided in the book has the back completely sewn and the dress worn by pulling it up the doll's body from the feet. I found this to be too tight for my liking and I felt that for the girls, having a dress that fully opens up on the back would make it much easier to handle. Tote bag...what a stylish and perfect accessory. 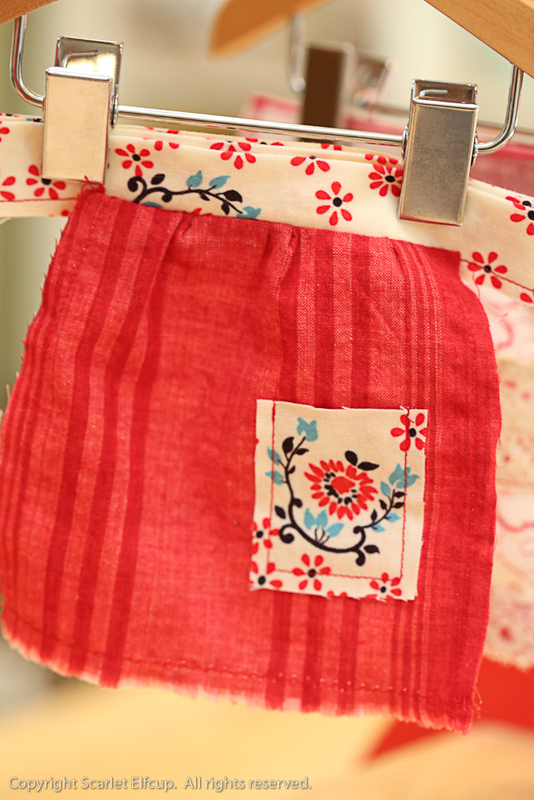 Every dolly needs a bag to carry little treasures or even goods from the farmer's market. Jess Brown's tote bag is designed to give the maker an opportunity to play with small swatches of fabric for a truly unique result. As I did for the sundress, I also altered the design of the tote bag to my liking. 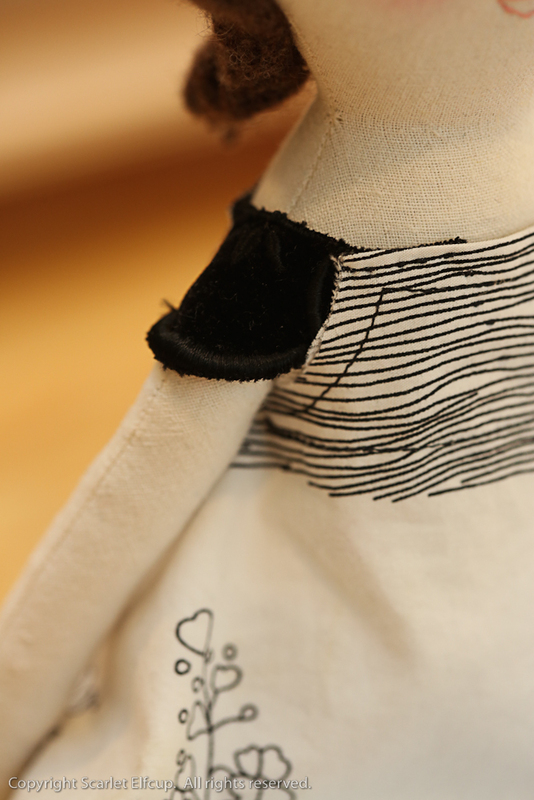 Jess Brown's tote bag is a very simple design that gives a vintage and unfinished look. 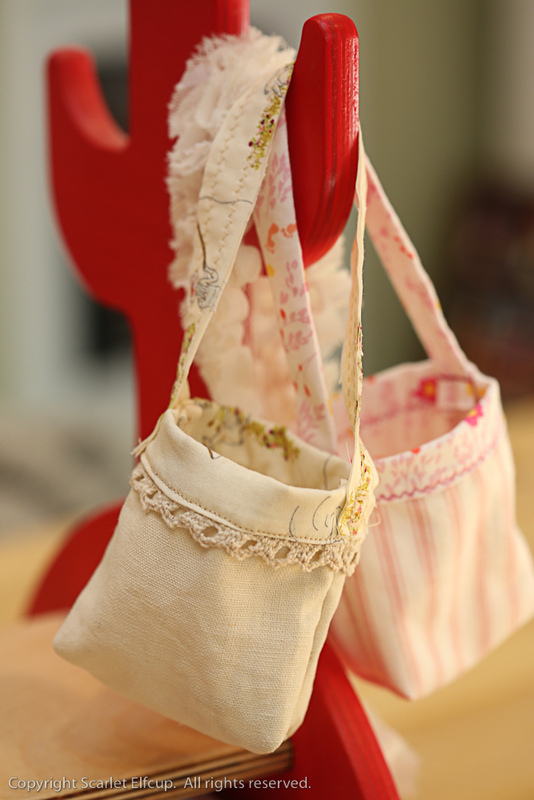 For the tote bags, I wanted to give a sturdier and more finished look. So, I adjusted a few minor things on the tote bags and made them so that they are lined on the inside with a pretty fabric and embellished on the outside with beautiful trim. Overcoat...sew in linen or any type of fabric you desire, add trim, use different details for the drawstring. 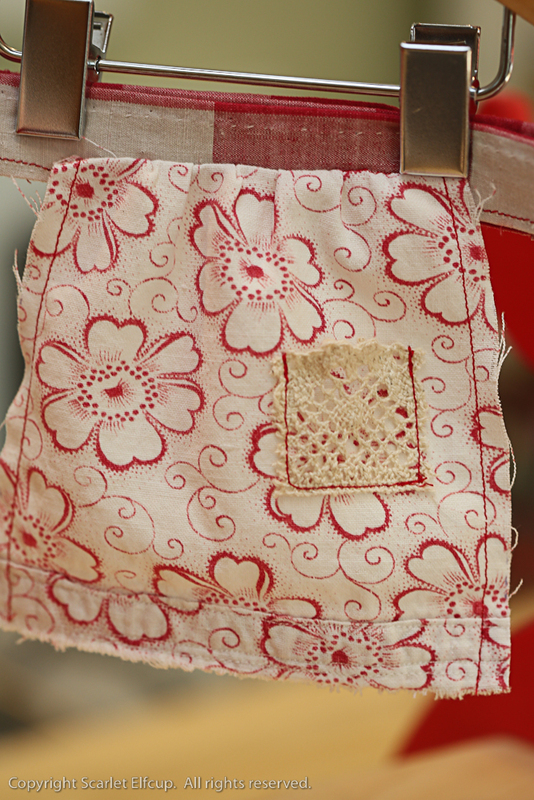 Quilt...have scraps of beautiful fabrics laying around that you don't have the heart to toss? 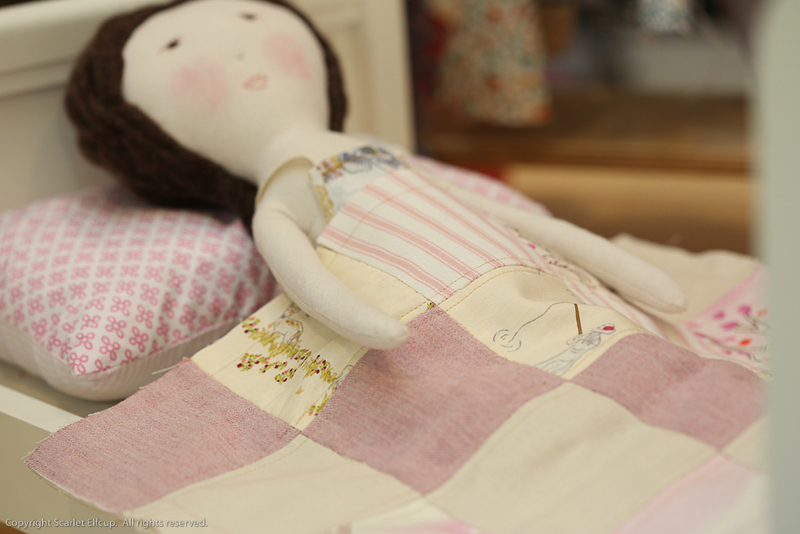 Here's your chance to use those scraps up for a beautiful creation...a doll quilt. 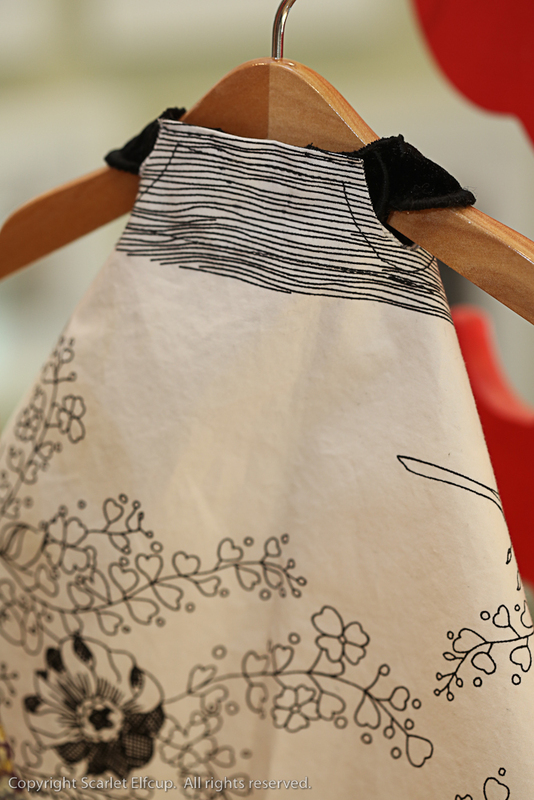 Drawstring dress...all little dolls need a special occasion dress. Jess Brown's drawstring dress gives the opportunity to use your most lovely fabric pieces to create a dress that can be worn on special events. And we know all dolls have special events they attend...birthday parties, ballet outings, playdates. Use buttons and trim to your heart's content. 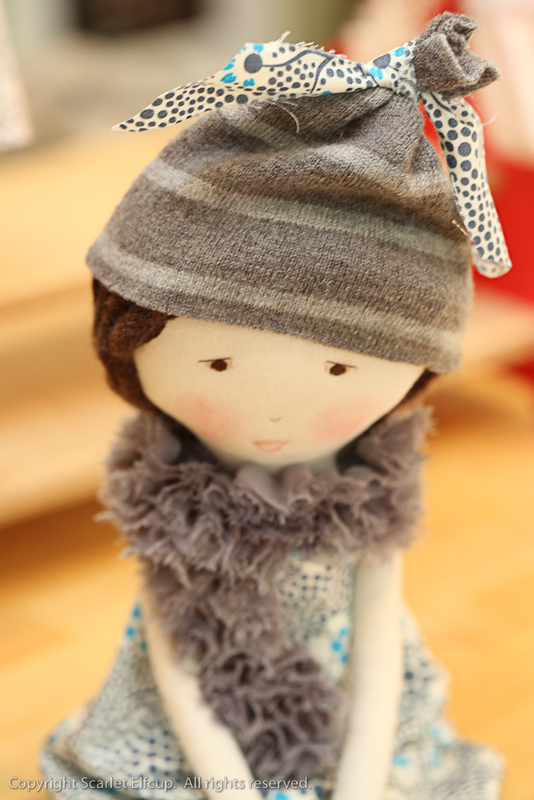 Sweater scrap hat...take those old sweaters that you love but just don't wear anymore, wash them and cut them up for this doll's hat. Make lots and make many in different shapes and colors. Add beautiful pieces of ribbon to embellish. Apron...we all love having a friend to cook with. 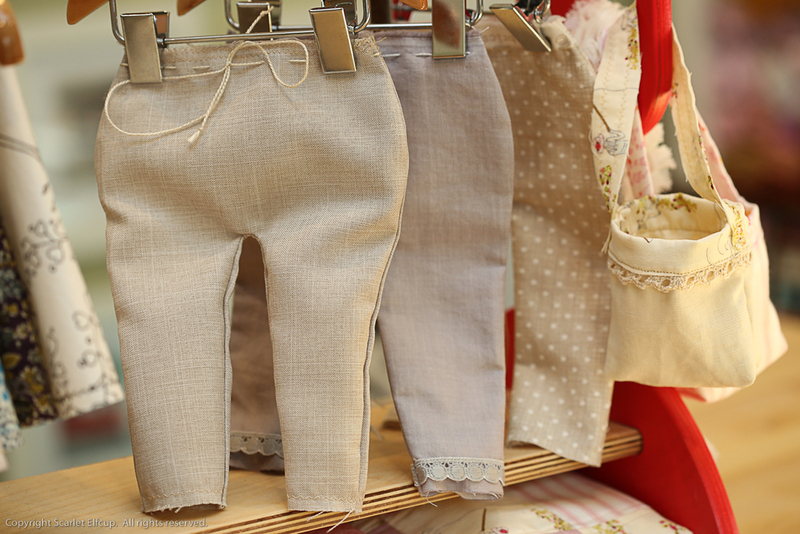 So, surely, your doll will need an apron for those cooking festivities. 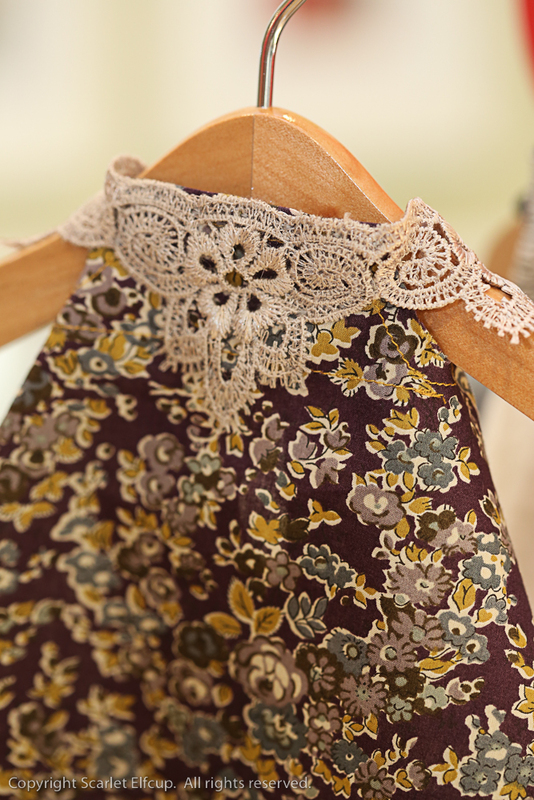 For the aprons I made for our Jess Brown rag dolls, I loved using some French vintage fabrics that I had laying around. I played around a bit with using trim for the pocket. ...a birthday crown for the birthday girl...made from 100% Belgian wool felt, embroidered #7 with a metallic colored embroidery thread, and embellished with a royal blue trim. ...a necklace made from embroidery thread fed through several balls of wool felt. 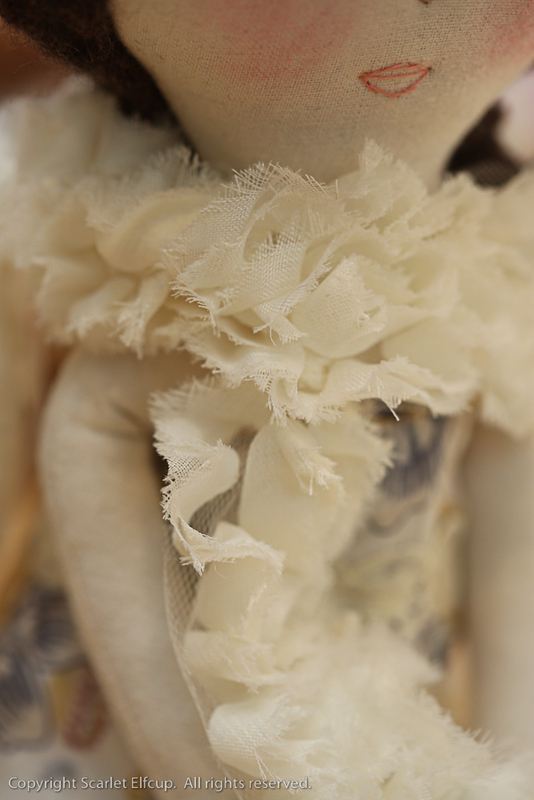 ...a couple of simple scarves cut from a ruffly trim to grace the necks of these fine dolls. Truly, the opportunities for creativity are endless. 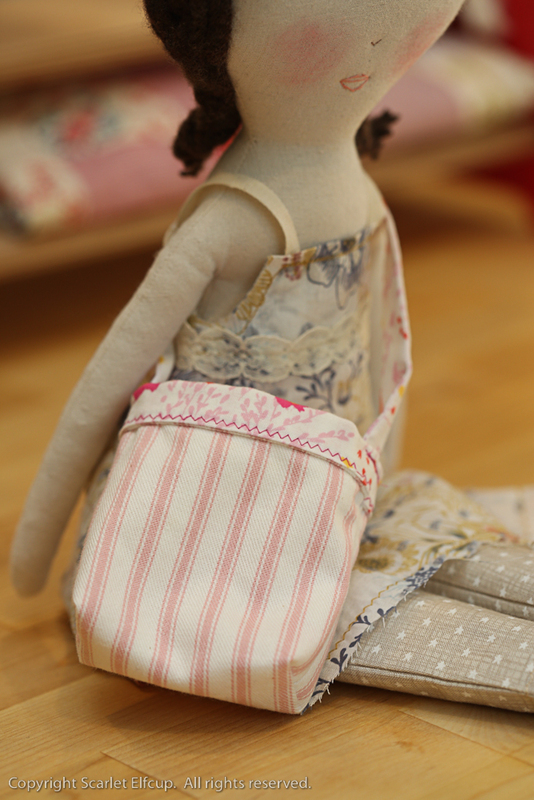 There are so many other accessories that you can add for Jess Brown's rag doll. It's just a matter of creativity, time and resources. So, there we have it...two natural fiber, homemade, handmade beautiful Jess Brown rag dolls created uniquely for the children in my life. 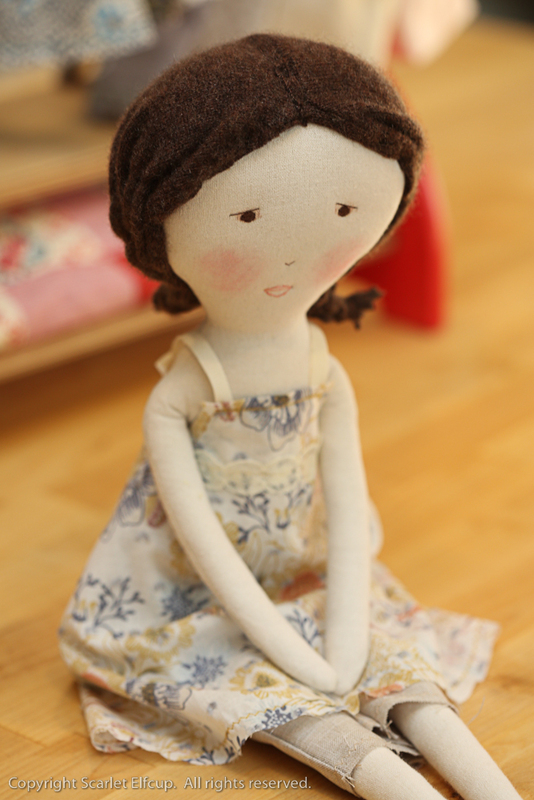 I hope this inspires you to try for your very own making of a Jess Brown rag doll. Jess Brown's "The Making of a Rag Doll" can be found on Amazon or from Jess Brown's on-line shop. 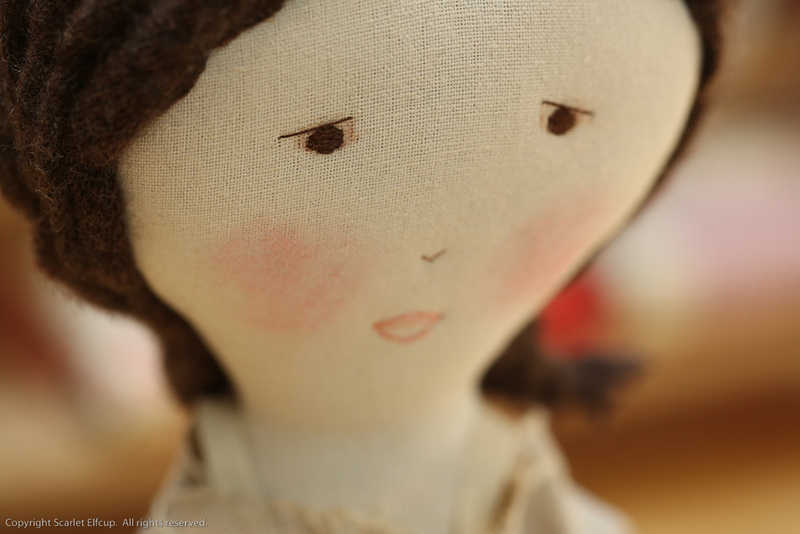 If you do get around to making your very own Jess Brown doll, I would love to see how yours turned out and how you made it uniquely your style. Enjoy and thank you for visiting the blog.